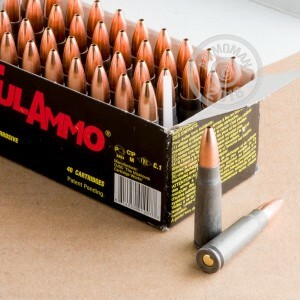 If you're going after feral hogs or medium-sized deer with your AK, Mini-30, or SKS then this is the perfect ammunition for you. 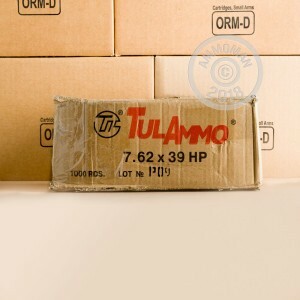 Tula Cartridge Works is a Russian manufacturing plant that has been in the business since 1880. 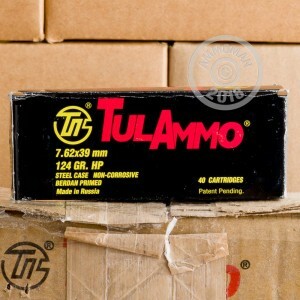 As a global exporter, they are well-known for using their experience to offer quality ammo at an affordable price. These 7.62x39mm hollow-points, which either have a copper or bi-metal* jacket, are proven deer and boar rounds that penetrate deep and expand wide to leave impressive wound tracks. The casings are made of steel which isn't typically reloadable but does offer great cost savings so that you don't have go broke just to get out for a hunting trip. In order to reduce parts wear, the steel casings are coated with a softening polymer material. The cartridges are fitted with non-corrosive Berdan primers and the 124 grain bullets leave the muzzle at an average of 2,330 feet per second. Great product fast shipping !!! The ammo performed great. No FTF or FTE. Ammo came in a couple days. I will order more.